The Worshipful Company of Feltmakers and guests gathered at Vintners’ Hall for our 2018 Spring Livery Dinner on the evening of Monday 9th April. As an itinerant Company we are fortunate to meet in the halls of the other Companies. Each has its individual character and the Vintners’, situated on the bank of the Thames, is rich with dark oak panelling and portraits of past Masters. The main Livery Hall dates back to 1671, during the reign of Charles II and just five years after the Great Fire. The panelling retains wood carvings depicting grapes and other images of viniculture and I find myself wondering how a Feltmakers’ Hall might be decorated. We were welcomed with a champagne reception, providing the opportunity to meet friends old and new. Without exception, the ladies were resplendent and the gentlemen elegant in black tie. 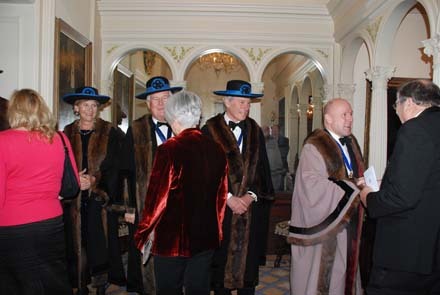 As we passed to the Livery Hall to take our seats, each of us was formally announced by the Beadle and welcomed by the Master. There were 122 diners including Masters of six other companies, the Cutlers, Glovers, Framework Knitters, Gardeners, Solicitors, and Hackney Carriage Drivers. 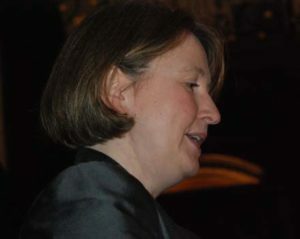 After a blessing from our Chaplain we enjoyed a splendid dinner which, as you would hope in the Vintners’ Hall, was accompanied by fine wine and followed by an excellent port. 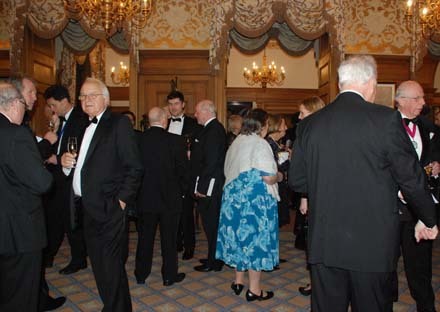 The atmosphere was extremely convivial and everyone appeared to be having a most enjoyable time. great social changes that have occurred since 1918, including voting for women. 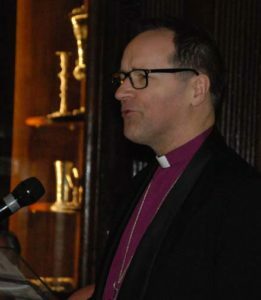 Our Master’s principal guest was the Right Reverend Dr Graham Tomlin, Bishop of Kensington. The Bishop gave a poignant account of his recent experiences aiding those affected by the Grenfell Tower tragedy, which occurred in his diocese. He described attending the scene while the fire was still spreading and his involvement in the long-term healing process within the community. The Bishop spoke persuasively about the need for us to care for our neighbours and, as we sat in the grand Livery Hall in our finery, it was a moving reminder of people in need of our support and how we should continue to use our great Company to help them. The Bishop then proposed a toast to the Feltmakers to which the Master, a friend of the Bishop since student days, gave the response. 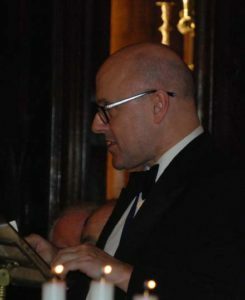 He recounted memories from their early friendship before leading onto amusing anecdotes from his legal profession and finishing with a description of the charitable activities he and the Company are carrying out during his year. The occasion ended with the Beadle inviting us to join the Master for a stirrup cup before we departed with memories of an entertaining and memorable evening.